Edinburgh Foody’s last visit to Chop Chop was in 2010, when they first opened their second outlet in Leith. Four years on, the restaurant still appears fresh and well kept. The glass roof allowed the evening sunlight into the front seating area, which I was impressed to see fill up quickly for a Tuesday evening. Everyone was going for the good value unlimited banquets. Split between two, it gives you a selection of eight dishes (more as your party size increases) from which you can reorder any as many times as you like. Since it was popular, and that’s what was had in the last review, we opted for it too. Everyone likes a banquet. However, I was surprised to see that in four years the banquet’s key elements hadn’t changed. Perhaps they’re outstanding stalwarts, I thought. But after tasting them, I would have to say they may be considered more tired favourites. We didn’t find the food to be exceptional; most dishes were either underseasoned or simplistic in their seasoning. Flavours were a one-note affair, and between the dishes the emphasis was more on texture variations. 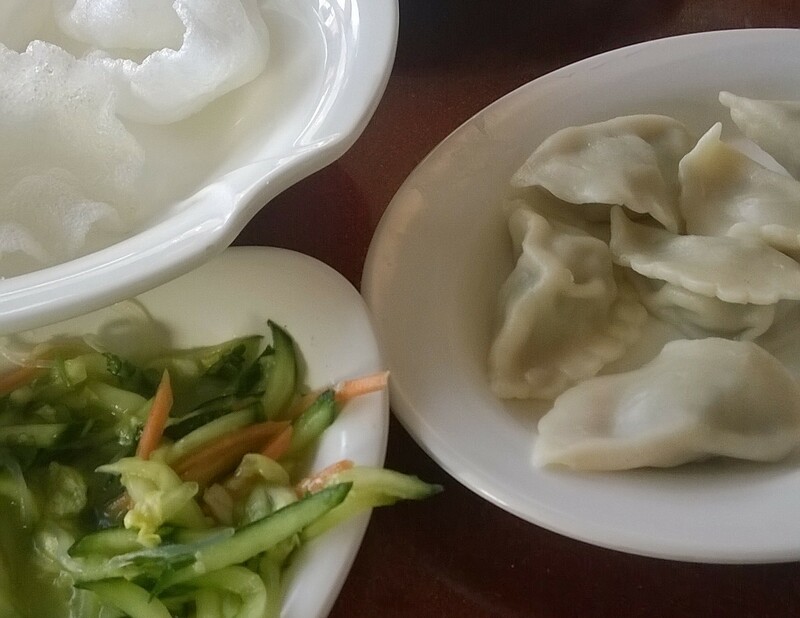 For instance, the soft pork and coriander dumplings were well made, but far too heavy-handed on the coriander. Similarly, the prawn dumpling came in a lovely crispy case, but were very fishy, with not much else to be said for them. The other diners’ parties were greater in number, and their banquets included sweet and sour pork ribs, which ours didn’t. But they looked great: dark, shiny sauce-laden nubs of meat and bone. As they kept passing us by, we ordered them on top of the rest of our banquet – which I must say was not out of hunger, just pure gluttony. And they were indeed good. Each bite-size piece was well-cooked, not too tough, and covered in very sticky, very sweet black treacle. But they weren’t sour, nor was there any hint of, say, five-spice or any other seasoning. Damn, they were addictive though. And perhaps that factor explains Chop Chop’s popularity. Of the other stronger dishes the crispy salt and chilli squid stood out. It was savoury and fiery in equal measure. Likewise the cucumber salad with fine noodles, sweet with a touch of sesame, was better balanced than some of its tablemates. 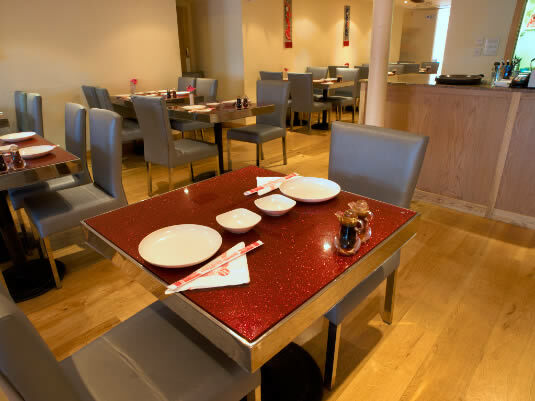 The location is wonderful; the restaurant clean, modern and spacious. The staff were helpful and we had a very pleasant experience. I’m no connoisseur of Chinese cuisine but I can say for sure that Chop Chop is a cut above the rest. The dishes weren’t oily or viscous in that way Chinese takeouts can sometimes be. Even the prawn crackers were light and crisp. I would recommend it highly on value for money, but I would suggest ordering off the banquet menu. It may be that’s where something really special is to be found. Last updated by AmyB at January 31, 2015 .